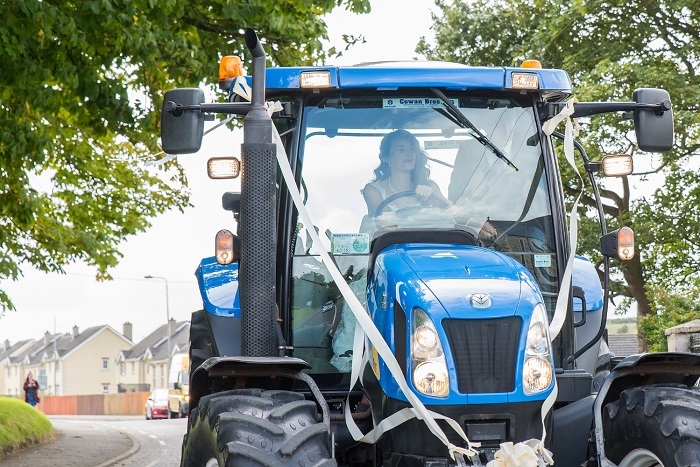 Bride drives herself to her wedding - in a tractor! Lucinda Boyce and Gary Mulhern had a very special fleet of vehicles at hand on their wedding day! 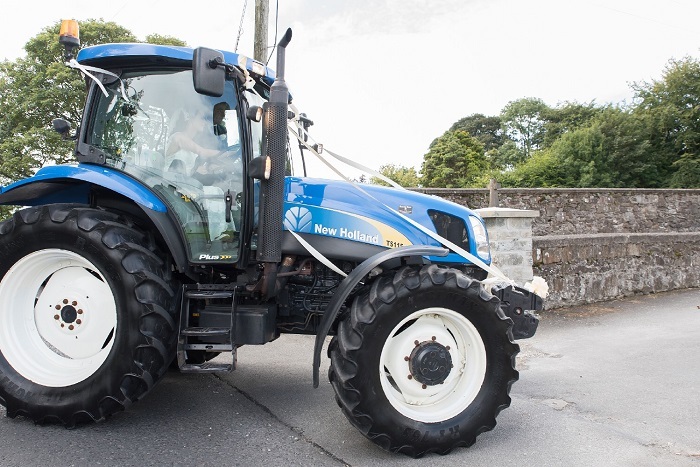 Lucinda walked up the aisle of St. Mary’s in Ramelton on the 19th of August, after driving herself to the ceremony – in her dad’s tractor! “I grew up on daddy’s farm, and then with Gary being a farmer himself I would still help out a lot on the farm, we wanted to bring the farming into our wedding so we thought we’d do it with the wedding transport! The happy couple met at a Nathan Carter concert through mutual friends in the Allingham Arms Hotel in Bundoran. Lucinda’s story of how Gary popped the question also has a farming theme, making the tractors even more special to the happy couple. “Gary asked me one day to come out and help him feed the sheep. I thought nothing of it, I drove to the middle of the field and got out of the jeep by the sheep feeder. Next thing when I turned around he was down on one knee! It was something different, a lot of my friends get taken away but I just get taken out to a field in Donegal Town,” she laughed. “It was very different, it was something that was very unique to us, it’s something that suited us and it really fit in with our everyday lives. There are loads of vintage cars we could have chose from but they wouldn’t have suited it – it was the tractors that made it for us on the day. “People that would have driven past the chapel and saw the tractors wouldn’t believe me when I said it was for my wedding! It was just so different, it really worked for us. Before the big day, Lucinda says both tractors were preened and polished for 5 to 6 hours each to get them nice and shiny to prepare for their special reappointment as wedding vehicles. “Soon after the wedding, everything was back to normal, one of them was out bringing home peat and the other was spreading fertiliser on the farm,” she said. After the magical ceremony, they took their wedding photos at Lucinda’s father’s farm. “Our photo location was daddy’s farmyard in Ramelton, we drove there in the tractor and then took it to the reception in the Silver Tassie. We tried to incorporate as much of the farm as we could. “I’d love to do it all over again, the buzz of driving the tractor to the ceremony, there were even people waiting outside to get a glimpse of me taking it to the chapel! “The farming has been brought into everything,” she smiled. Lucinda and Gary are hoping to have a dream honeymoon in New York after Christmas, but nothing is set in stone just yet – we’re not sure how many farms there are in the Big Apple! Pictures by Martin Fleming Photography.